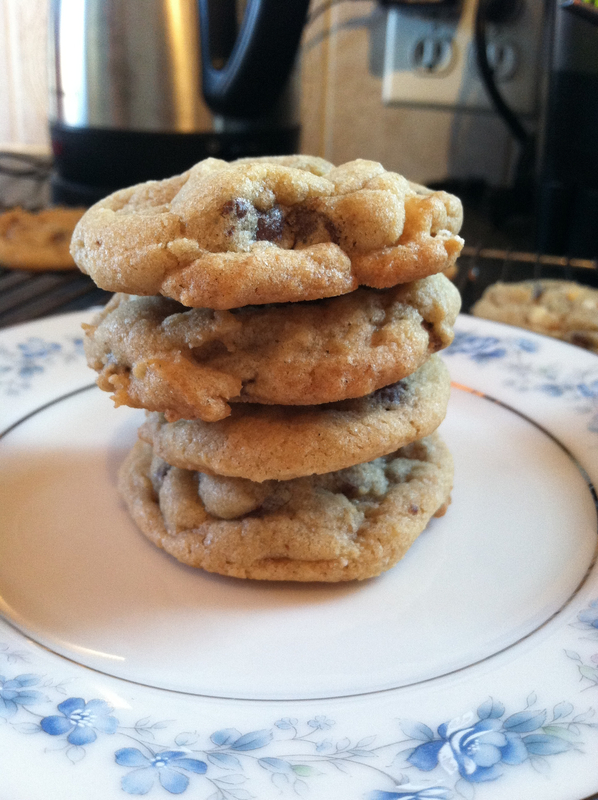 Black & white chocolate chip cookies. – Carbs & Fiber. Black & white chocolate chip cookies. Well, it only took me about 25 years of making cookies before I finally solved my flat-cookie problem. But I have a problem with cookies: aesthetics. My cookies just never look as nice as I would like them to look. Of course looks are not really important in a cookie, but it drives me a little bit crazy, particularly if I’m taking them somewhere to share. I can’t make a nice-looking chocolate chip cookie to save my soul. I’ve tried a lot of things to fix this. I’ve used half shortening and half butter. I’ve used all shortening. I’ve tried adding a half cup of pecan meal, sifting the flour vs. not sifting the flour and at least a dozen other tricks, all to no avail. Flat cookies, every time. 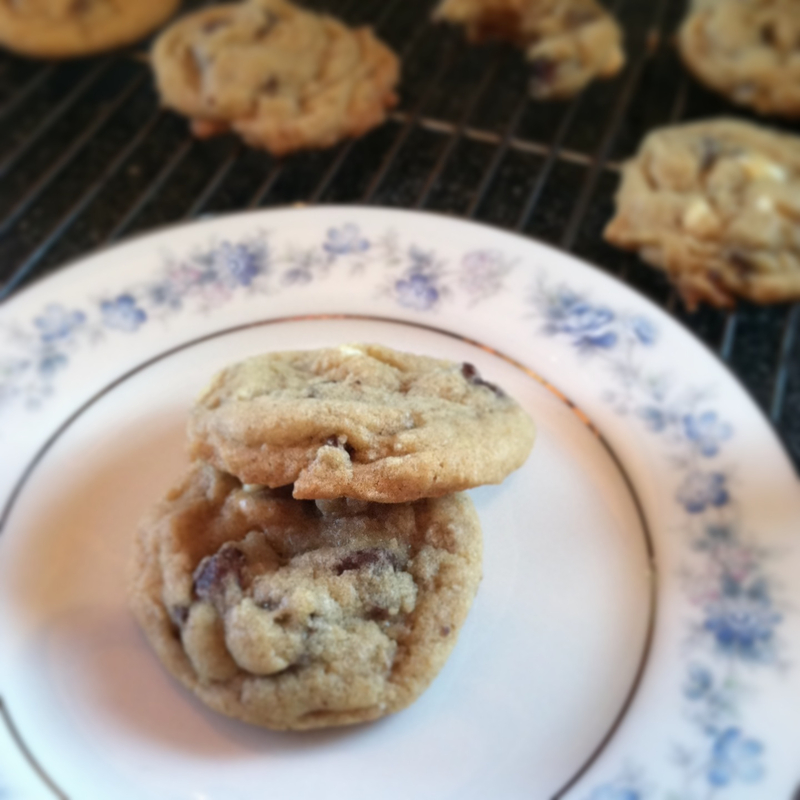 So imagine my delight when I made a humble half-batch of chocolate chip cookies and they turned out both delicious and nice to look at. My adapted recipe is below. I believe the difference this time around was using slightly colder butter than usual—just a few minutes out of the fridge rather than room temp as I am used to doing. I also made my own brown sugar, which may also have had an effect. This is probably a “duh” for more experienced cookie makers but I am proud to have finally cracked this (perhaps very obvious?) code. Combine flour, baking soda and salt in small bowl. Beat butter, granulated sugar, brown sugar and vanilla extract in large mixer bowl until creamy. Add egg, beating well after addition. Gradually beat in flour mixture. Do not over beat—dough should just come together. Stir in morsels. Drop by rounded tablespoon onto ungreased baking sheets and bake for 9-11 minutes or until edges are golden brown. Cool cookies on wire racks; store in an airtight container. Oh I will have to try that butter trick! Good call!